Andrew and I have often said that miso is so good, we think it could change the world. With its salty taste and buttery texture, this fermented paste super-charges soups, salads, and marinades alike. I tend to buy the mellow yellow rice version, but barley miso and soybean miso are equally tasty. Here’s a simple miso dressing that I’m particularly fond of on a mixed green salad with shredded carrot, green onions, and tamari pumpkin seeds. Put all ingredients in a mixing bowl and whisk briskly until well blended. Keep in a jar in the fridge for salads, marinades, or drizzled over steamed kale. If you want to thin it out, simply add more water, a teaspoon at a time, until it reaches desired consistency. This is also really good on steamed kale. The other day we had left over kale, rice, and some tofu from dinner the night before. 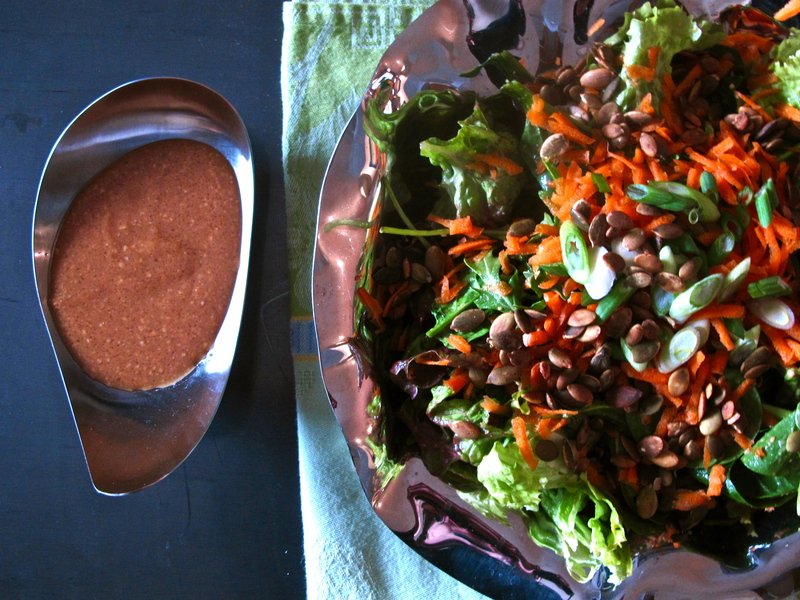 We just piled it all into a bowl, added a bit of this dressing and it was a superb lunch. Enjoy!